Welcome to Day #5 of Chocolate and Central America Theme Week. 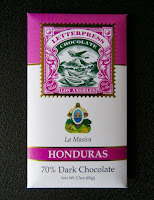 *Honduras was once a major exporter of cacao; however, a 1979 hurricane (that destroyed cacao trees) and other factors slowed down production for many years. 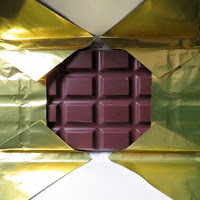 It's encouraging to see more chocolate coming from this area in the past several years. The government has funded programs that help farmers produce fine cacao and chocolate makers in the U.S. have both contributed to and benefited from local, in-country expertise. La Musica is affiliated with FHIA, a non-profit "agroforestry project that serves as a gene bank for other projects in Honduras," and in today's case benefited from the presence of an expert in fermentation (Daniel O'Doherty) and related in-country expertise crucial to producing great cacao for chocolate makers.